Long Handled Beauty Body Care Grooming Range. This long handled beauty body-care range is ergonomically designed and carefully balanced to provide maximum power with minimal effort and strain. Each product has a unique shape that makes it easier to reach further. 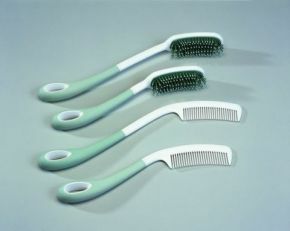 Both the comb and the brush are shaped to follow the curve of the head, allowing the handle to be held close to the body without losing power or reach.